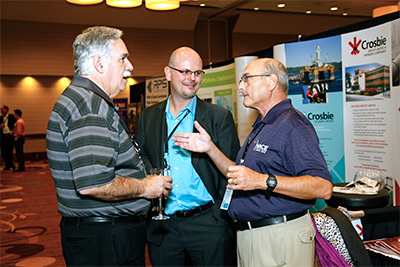 Attendees of the Northern Area Eastern Conference want to learn about the latest products and services in corrosion prevention and mitigation. This gives exhibiting companies the opportunity to showcase how their products and services can be effective in assisting with these concerns. Exhibits are selling quickly. Contact the NACE Exhibits Department today at sales@nace.org or by phone at +1 281-228-6411. Additional booth attendant registrations may be purchased for $300 USD. Sponsorships provide the opportunity for top companies to stay at the forefront of decision-makers’ and conference attendees’ minds. The Northern Area Eastern Conference assists exhibitors with their brand awareness by offering additional ways to catch attendees’ attention through Sponsorships. For more sponsorship information, please contact Sales at +1 281-228-6446. *Sponsorship includes production of 150 notebooks. Sponsorship must be sold by September 9, 2019 for fulfillment. *Sponsor responsible for providing giveaway item. Sponsor responsible for providing giveaway item. Giveaway item must be approved by NACE. Sponsor may choose to ship giveaway item to NACE HQ by September 16, 2019, or sponsor can choose to bring to conference for distribution. *Sponsor responsible for providing giveaway item. Sponsor may choose to ship giveaway item to NACE HQ by September 16, 2019, or sponsor can choose to bring to conference for distribution. If option 1 is selected, sponsorship includes purchase and production of napkins. In the event that multiple sponsorships are sold, all sponsor logos will be imprinted on each napkins. Sponsorship must be sold by September 16, 2019 for fulfillment. *Sponsorship does not include production of 150 tote bags. Sponsor responsible for providing giveaway item. Giveaway item must be approved by NACE. Sponsor may choose to ship giveaway item to NACE HQ by September 16, 2019, or sponsor can choose to bring to conference for distribution. *Sponsorship does not include production of 150 business card cases. Business card cases must be approved by NACE and must be shipped to NACE HQ by September 16, 2019 or sponsor can choose to bring to conference for distribution. *Sponsorship does not include production of 150 double ended bulldog clipped lanyards. Lanyards must be approved by NACE and must be shipped to NACE HQ by September 16, 2019 or sponsor can choose to bring to conference for distribution. *Sponsorship includes production of coffee cups. Sponsorship must be sold by September 9, 2019 for fulfillment. *Sponsorship must be sold by September 16, 2019. *Sponsorship does not include production of 200 pens. Pens must be approved by NACE and must be shipped to NACE Headquarters by September 16, 2019 or sponsor can choose to bring to conference for distribution.